Written by Gregory on Dec. 19, 2014 in Development, Society. How much control do you have over what happens to your character in a tabletop RPG? Can people do things to your character without your permission? Do you want them to? In most mainstream tabletop roleplaying games, you control your character's actions but not what happens to them. You choose how they feel about events, but not the other effects. A combination of the rules and the game master's judgment decides whether your character gets scared, hurt, or killed. Last update on Dec. 19, 2014 . Written by Gregory on Sept. 29, 2014 in News, Retrospective. 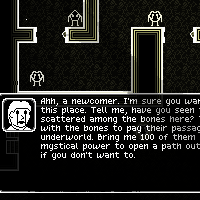 We've been selling our game Ossuary for $5 for almost a year now. We just set its price to $10 at each major storefront where it's available. Last update on Sept. 29, 2014 . Written by Melissa , Gregory on Sept. 7, 2014 .
you know about samsara, right? security company i worked for for a few months? they dont deserve to exist, they call themselves security experts but just help more people die. Last update on Sept. 7, 2014 . Written by Gregory on Aug. 23, 2014 in Development, News. The only perfect computer security setup is one even the creator can't access. Last update on Aug. 23, 2014 .